Ok so we searched around and found a great place to get discount lift tickets to the different Lake Tahoe ski resorts. The smaller resorts tend to offer more discounts than the larger big boys because they need to compete. The discounts vary from month to month and from place to place. Don't expect any discounts during any holiday period as most of the resorts don't need to drum up business during peak season. We are always looking for seasonal discounts so if you hear about one, please share the wealth! 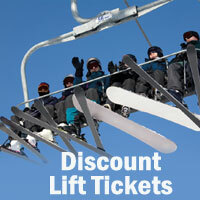 This year our discount lift ticket partner has expanded so there are a lot more cheap lift tickets available. Hot this season is Heavenly Valley and Kirwood, both in South Tahoe. In North Lake Tahoe, Squaw Valley and Northstar are favored by vacationers, but Alpine Meadows is the locals favorite. Homewood Mountain is quieter and slower but it is one of the only resorts that has a view of the lake when you're on the slopes or chair lifts! If you're looking for a really good inexpensive family resort you will want to ski Diamond Peak and Mt. Rose which are in Tahoe North in Nevada. The specials come and go so check it out often We can get specials for the following resorts. All the information appears online. While we're talking about skiing and riding. Did you know that renting skis in Tahoe are a pain? We have made it much easier for you to get your Lake Tahoe ski rentals. You place your order online, and they are delivered to your door no matter where you're staying; North or South Lake Tahoe. No need to search high and low. It is much easier to rent ski when you're already at the resort that you don't have to lug them in the car. If one of your bindings needs adjustment, or your boots rub you the wrong way, then you can also get your skis services. While shortages do occur you can elminate that by planning your rentals a few days in advance so that the perfect size is waiting. So that is 2 more great services to make your vacation in Lake Tahoe grand.